you may be asked if you want it to update itself automatically: say NO - you don't want it updating in the middle of an exam! It's important to make sure the 'Select Tool' and the 'Hand Tool' are displayed on the top toolbar. if you see a 'How To' window on the right side of the screen, uncheck the 'Show How To Window at Startup' to turn this off. Right-click on the grey toolbar at the top of the screen and select 'Reset Toolbars'. Right-click again on the grey toolbar and in 'Select & Zoom', choose 'the Select Tool' and then the 'Hand Tool'. Click on 'Edit' and then 'Preferences' and click on 'Reading'. Set the Reading Order to 'Infer reading order from document (recommended)'. In 'Pages vs Documents', choose to 'Only read the current visible pages'. Deselect 'Use default voice' and choose a voice from the menu. Deselect 'Use default speech attributes' and choose the pitch and speed you prefer for the voice. This option will improve the clarity of the text displayed on screen. Click on 'Edit' and then 'Preferences' and click on 'Page Display' (top of the list). and one with spellcheck disabled. The different files are identified with 'SpellCheck' on or 'SpellCheck off' in the file name. Before using the spellchecker, set the options and dictionaries. Click on 'Edit' and then 'Preferences' and click on 'Spelling'. 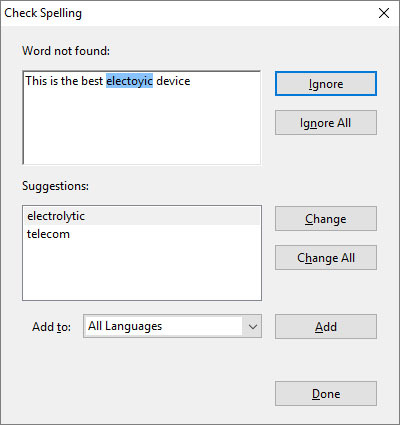 Ensure 'Check spelling while typing' is ticked. Choose an alternate 'Underline colour' if you wish, particularly if you have altered the Adobe Reader page and text colours. Select the 'English (United States)' dictionary and press the 'Remove' button. Tick the 'English (United Kingdom)' dictionary and click 'OK'. Click on 'Edit' and then 'Preferences' and click on 'Documents'. Under 'Save Settings', tick 'Automatically save document changes to temporary file every:' and then type in the time you want to have between saves. The default is to save every 5 minutes. Before letting any student use the system it is vital that you are familiar with its operation. Test the paper before the student starts! Work on a copy of the paper. Make sure you don't insert any answers into the one you are going to give to the students!